It would be just a matter of time now, when England would retain the Ashes and keep the honour by themselves and humiliating Australia. With just four Australian wickets left and tottering at 169, they are on verge of facing an innings defeat, as England would be desperately waiting for all this to finish, and would finally get to rest with a sigh of relief. Australia after England's mammoth 513 had to produce something miraculous in order to save the day, but it was not the case. After slumping miserably at 98 in the first innings it seemed like as they have forgot handling the bat.English bowlers remained totally at the top, dictating their terms, being nothing more than a stair master whipping Kangaroos to misery. Earlier when England resumed batting on day four, Aussie bowlers tried to make their mini impact, with Siddle taking six of the wickets. But Jonanthan Trott the centurion and Prior's impact remained the head lines, ultimately they well at 513 with Trott at 168*, still wanting some more action, but fell short of his fellows. Australia starting with a deficit of 415 runs, it was looking like a never ending run. Though Shane Watson looked daunting, but remained short lived and till now being the only to score half century, finally dismissed at 54. Ricky Ponting , who had some torrid time in the field , both with bat and the umpires failed to improvise and inspire, fell silently at 20. Mike Hussey, who had been Australia's saviour on many occasions this Ashes series could only bag a Golden duck in his kitty. Steven Smith provided with some resistance, but at the end they were just playing for the lost cause already. 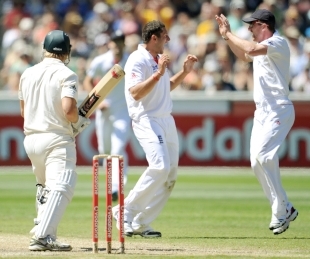 Tim Bresnan being the start took three wickets, with Anderson and Swann getting wicket a piece. Now the question at the end of such an eventful fourth day is, what has gone with the All Star Kangaroos?. Either Ponting has lost grip over his team, or they all as a team have lost their way.